After years of working yourself to the bone, it’s not surprising that your joints ache and mind constantly feels fatigued. 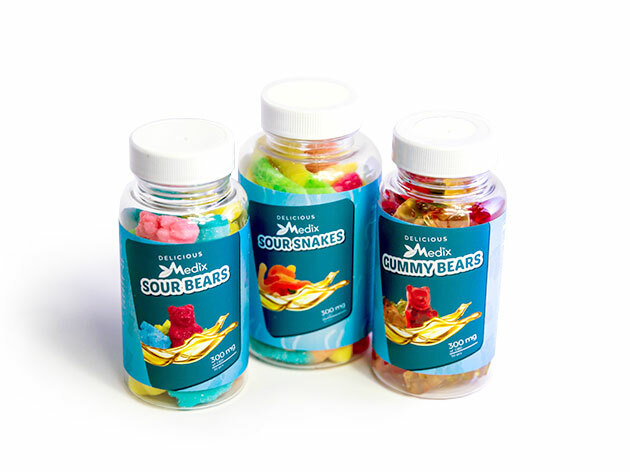 One great way to remedy the situation that is completely all-natural and non-toxic lies in Medix CBD Gummies (300MG). Derived from legal industry hemp, CBD oil is the ultimate way to take the edge off without any of the psychoactive effects of THC. The key ingredient in Medix CBD Gummies (300MG) is the premium quality Phyto-cannabinoid-rich (PCR) hemp oil. This carefully formulated active compound is infused into these delicious CBD gummies to help you destress, sleep better, and fix body aches. Each container has 30 CBD gummies that are broken up into 10mg servings for optimal dosing. Unlike the consumption of THC, ingesting CBD oil has no mind-altering effects. You will never feel high or impaired when taking a CBD gummy. There are no negative side effects, and CBD is completely natural. Extracted from a plant, CBD oil is 100% pure and not created synthetically in a lab. Plus, CBD will never show up on any drug test. Start feeling better today with the Medix CBD Gummies (300MG). For a limited time, you can get them for under $30, which is over 40% off the original price.